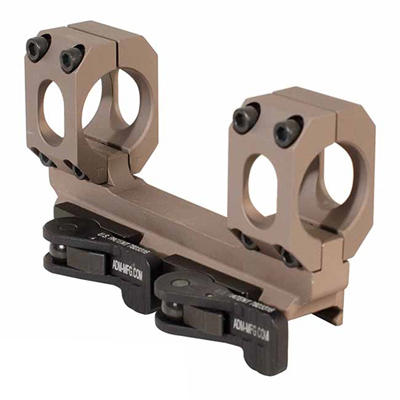 The AD-RECON-S 40 MOA mount is made for putting high power glass onto a flattop style AR-15 or bolt action rifle. Features 40 MOA of elevation built into the base for long range shooting. TO BE USED FOR EXTREME LONG DISTANCE SHOOTING ONLY. The AD-RECON-S 40 MOA is a straight up scope mount with no eye relief built in. The arrow marking on the mount will point toward the muzzle when mounted. It is precision machined from 6061 T6 aluminum and finished in hard coat T3 Mil-Spec anodize. It features the Patented QD Auto Lock Lever system to accommodate both in spec and out of spec rail systems. For 1" rings.